As you can see, the blog has been given a facelift. For some time now, I have been meaning to do this, and as Cannes is looming, I knew I had to do it sooner rather than later. I plan to update the blog daily in Cannes, and hopefully with either some audio or even video podcasting. Let’s see. It’s amazing how much time can be spent on a website, and I am just pleased that the new look blog is built and I can get on with more pressing stuff – like writing the screenplay! 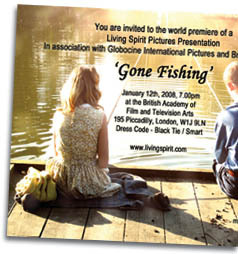 As part of my preparing for Cannes, I decided to make new ‘Gone Fishing’ business cards. It was cheap as chips to do at VistaPrint and done and dusted in under 30 minutes. I used one of the main images from the film, shot by DP Vernon Layton, and then mocked up a logo that will do for now – we are still looking forward to what the Creative Partnership will come up with, but I had to get these cards printed now or risk not having it sorted before Cannes. Over the years, I have noticed a gradual shift in the way we swap details – it used to be a ‘calling card’, but now it’s more often a digital file – an email, beamed phone contact (that never works) or a text (which in Cannes will cost a few quid to send!). I am a serious techy myself but I am still staggered at how utterly rubbish computers seem to be at things like swapping addresses and the like, and don’t get me started on the hideously over engineered MS Outlook! I guess iPhone is the way forward in the film business, and I am sure will see a proliferation when in Cannes next month. For now, I am happier with my glossy business card with a great image from the movie, and my contact details on the reverse. So after being out on the road for a few days with my new Asus EEE ultra portable laptop, I can confirm that it's really a perfect balance between power and portability. I have started to get my head around the Linux Operating System (which the EEE comes with), which I still maintain, is NOT for the faint hearted. But if you could get around with DOS many years ago, you will take to Linux very quickly. I have added a few programs, all of which are free. Things like GIMP (which is like Photoshop), Audacity (audio editing), Thunderbird (email client) and plus a bunch of utilities, and I will be installing Crossover, a Windows emulator, so I can run Windows programs that I can't find equivalents for in the Linux world. I am really impressed by Open Office (MS Office like suite) and in some ways, I can't believe major corporations don't make the switch, they would save a fortune. Open Office is after all, free! As for the actual computer, it's very nippy. I never click and wait. Sure the screen is small as is the keyboard, but that means it's ultra portable – and I can plug in a screen and run it in higher resolutions when using it back at 'base'. So I have Office, Internet, Email, wireless, all on the move and as light as a feather. I have also found the EEE to be a geek magnet. Just switching it on in public draws people over to ask 'What is that? ', 'How much did it cost?' 'Where can I get one....' It's amazing how people are wowed by it. Perhaps the best thing about the EEE is that I can drop it in my bag and really not feel in any way that I am lugging a laptop. Awesome! For years I have been in search of a portable computer. Powerful enough to do what I need, small enough (and tough enough) to carry in my bag without really noticing it. I have tried all kinds of devices in the past, and I just bought an Asus EEE – a tiny laptop that has no hard drive (uses flash memory) and runs Linux (though could run windows, even MacOS, but I think it would become interminably slow with either). It’s pre loaded with a Linux OS, plus loads of software like Open Office, and so far, everything I have thrown at it hardware wise, has worked first time – USB mouse, Bluetooth wireless keyboard, Bluetooth wireless presenter, USB memory sticks, USB hard drive… And it has to be said, Open Office is astonishing! 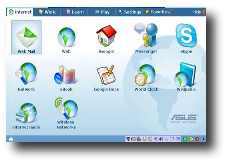 It’s open source free software, and to anyone who needs all the functionality you would normally use day to day in MS Office, it does the trick, and very well too. I was blown away by the Powerpoint style presentation module which even ran with my Bluetooth presenter. To me, it feels just like I am using Powerpoint. This means I can carry my presentations around with me anywhere I go, and be free to update it on the road. And it’s the same deal for scripts too, though I have to figure out some way of converting between formats. I bought this really because I can see that over the next year or so, I may have some long breaks away from the office, maybe sat in hotel rooms or airport terminals, and I wanted to use that time. Also, it makes writing the blog (like this first test one from a coffee shop) very easy on the road. Best of all, it’s cheap, the basic model EEE 700 coming in at £200, though I would recommend the EEE 701 (for a whole host or reasons I wont go into here). And yes I know there is a newer version on the horizon with a bigger screen, more RAM and faster processor, but what’s new? It is a computer after all! 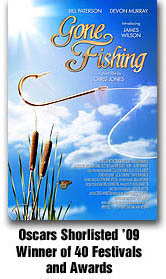 I had an interesting mail today from another film maker complaining about Quicktime – apparently the trailer for Gone Fishing would not play on his computer. And this is not the first occurrence of this, so if you have had problems playing back the Quicktime trailer, drop me a line – it would be useful to know if this is a 1 in a 100 problem, or 1 in 10 problem. We decided to encode a Windows Media file too, so anyone with a QT hiccup would still be able to view the trailer (it’s on the trailer page now). On balance, Quicktime yields a more defined image, but it also has less contrast and colour saturation (after trawling the forums, it appears that this is apparently a big problem with Quicktime with no real solution as yet). 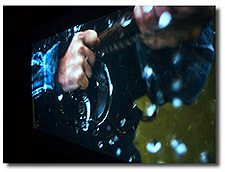 The Windows Media file (which is the same physical dimension as the QT and the same data rate) is softer, and denser in both saturation and contrast. 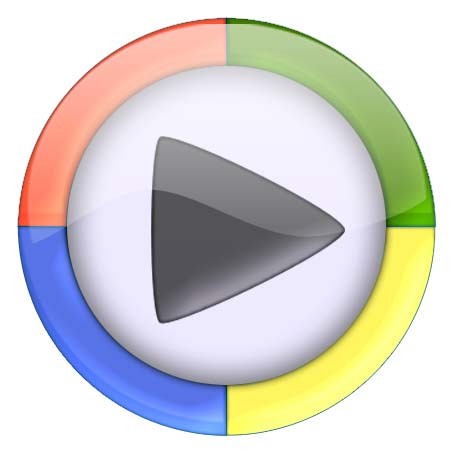 Personally, I still favour Quicktime, but if visitors have problems with it, they can now at least watch a Windows Media file that should be fairly bullet proof. These problems serve to illustrate the bigger problem we all face when trying to deliver our work in excellent quality but with a guarantee that it will work. I guess the promise of HD over the web is not really there just yet. Now the trailer has been up for a little while, I thought I would let you know how it’s doing and how I managed the infrastructure. When we decided to put a trailer up, we wanted it be world class quality, which meant using the Apple trailers website as a template. 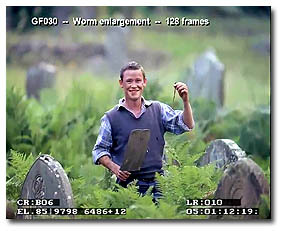 In turn that meant using the Quicktime H264 codec (which has its niggles I can tell you). We decided to do the trailer in three resolutions, 480P, 720P and 1080P, the resultant files being 18mb, 43mb and 70mb in size respectively. I had no idea how many downloads we would get, but I knew I needed more storage space and bandwidth than my current webhost could economically supply, so I needed another place to host the actual media files. So how is the trailer actually doing? Well I have had a lot of emails congratulating the team on it, which was great. So far we are averaging hits of around 250 a day, which I feel is pretty good. We had spikes on Sunday, Monday, a massive lull on Friday and another big spike on Saturday. 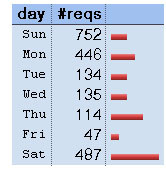 So the highest traffic seems to be at weekends and Mondays. In terms of time of day, most downloads happened at lunch times, early mornings or very late at night. It seems that most of us still have day jobs! I have also hosted two podcasts on Lunarpages. One with Adam Davies on funding, and the other with me about the Gone Fishing seminar next Sunday (you can hear it here but its not officially released from my site). 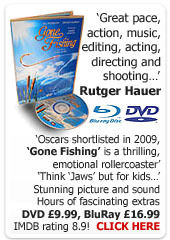 You can also view the Gone Fishing trailer here. I have spent the whole day on Storyboarding again – not working with Gabrielle this time, but planning the shots and ordering them so that next time we meet, I am clear about every single shot and how it will cut with each shot on either side. I am used to doing a shot list, and this is just a logical extension of that process. 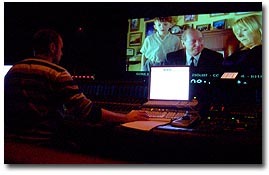 But I wanted to organise my shot list alongside the actual boards – which is when I cam e across a superb little program called Springboard. 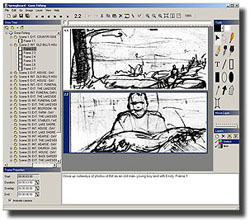 It’s shareware and costs $35.It’s essentially a tool for organising your boards and adding arrows and zoom / dolly lines. 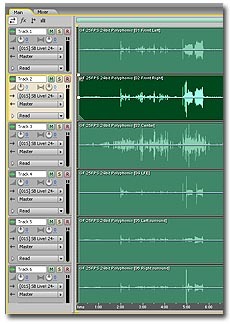 It’s not the most sophisticated program, but in this day and age of over developed software, it’s kind of a joy to use. For me, the real use comes in having a place where you can make an extensive shot list, with production notes, and marry that with storyboard sketches, then print the whole lot out neatly and cleanly. It’s also easy to re—order shots too, should changes be made. Plus it's got all sorts of drawing tools, which I don't use, but others probably will.